Not far from Brussels, Mons is home to a World Heritage Site, the former home of Van Gogh, and Roman ruins. 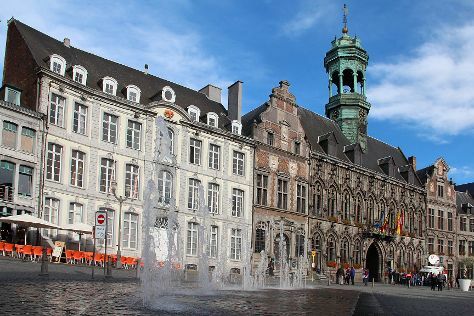 Visitors come to experience a plethora of museums and historical buildings, including the Baroque-style belfry from the 17th century, the city hall, and a house belonging to the artist Van Gogh during his time in Mons (which is open to the public). The city's historical center draws tourists, as does an annual mock-battle that floods the city streets with visitors. Mons is in Hainaut Province. To personalize your trip to Mons, create itinerary details specific to you using our Belgium trip builder tool . Despite its close proximity to the capital, Mons attracts enough visitors in its own right to offer a small variety of accommodation options. You'll find mostly small, independent hotels clustered in the compact city center and, if you look carefully, a modest selection of low-budget lodgings. To cut costs, consider staying in Brussels and making the short trip by train for the day.